“FlutuArte is a floating open-air gallery that can be seen from both land and sky with the purpose of using art to bring people together. Its mission is to explore the degree to which art in public spaces can transform the community that owns it. 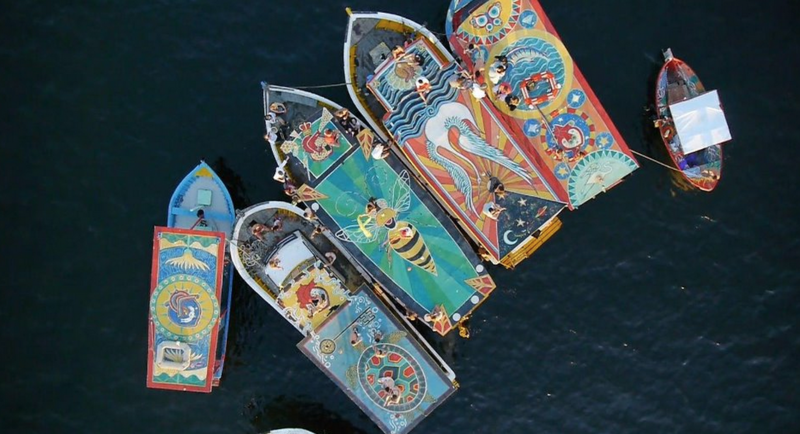 Artists from Rio and around the world are painting murals on the rooftops of fishing boats in the Quadrado da Urca, a harbor framed by the iconic statue of Christ the Redeemer and the Sugarloaf mountain in Rio de Janeiro. Each mural begins with a collaboration, a discussion between the artist and the fisherman. They sit together and form an idea for a painting that will combine their unique voices into a common vision. Soon all sixty boats in the Quadrado will be painted resulting in artworks that become a part of a larger whole –a public gallery that belongs to the fishermen and the community. FlutuArte was conceived by artists Maxine Nienow and Nicolina who were inspired to create the gallery after painting the top of a single boat and witnessing the positive effect it had on it’s owner and the community. 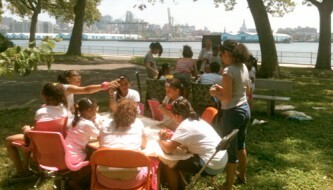 By bringing art outdoors, FlutuArte gives the public an opportunity to experience its transformative and powerful impact. More DETAILS and PHOTOS here!